Outside the Fire Restaurant on Dawson Street, Dublin 2. 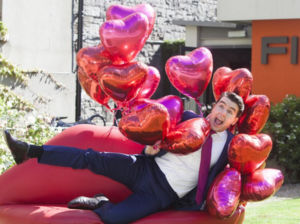 Comedian Al Porter was unveiled as the host of TV3’s new dating show, Blind Date, this autumn. Posted in Misc and tagged Al Porter, Blind Date, TV3 at 2:08 pm on May 19, 2017 by Broadsheet. I think Al would be the perfect host for Blind Date but can’t see the formula working in the internet age..
Why on Earth/on Earth not? I have a straight friend that does that all the time. I am now beginning to wonder if my conversation is listened to or just scoured for potential innuendos. Punnsters are always at it too…oh wait…. I wondered how long it’d be before someone played the “some of my best friends are straight card”. Some of my best friends are made of plastocine and biscuit crumbs, and they’re straight, and they do it too. But he’s not funny…..??? Who told him he was a comedian?